The 'real time compass' means you will see a compass on the screen directly during the level, that will be always updated while Lara's moving - so you don't need to enter the inventory again and again to study Lara's actual direction on the compass there. (But no, it's not the compass object of the inventory that we'll use as a base for our real time compass. Maybe you think this real time compass is an animated thing. Unfortunately, that isn't, I couldn't achieve that. This real time compass is about eight sprites. Each sprite shows a static state of a compass, showing the main directions. Now Lara turns a bit leftwards. The compass sprite won't be animated or won't be replaced, but a 'left' arrow (CUSTOM_SPRITES Texture 9) will show up, saying 'Lara's not facing exactly north any more. But she turned left only a bit, so she is still closer to the north direction than the northwest direction, that's why the compass still indicates north. So the left arrow means Lara's still facing north, not exactly, but she is close to that, on the left side of that'. Now Lara turns leftwards a bit more so she gets closer to the northwest direction than the north direction. 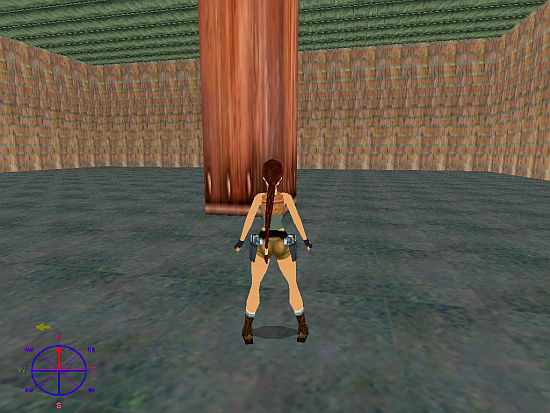 The 'north' static sprite and the 'left' arrow will disappear and the 'northwest' static sprite and a 'right' arrow (CUSTOM_SPRITES Texture 8) will appear now, saying 'the closest direction that Lara's facing now is northwest. But she's not facing exactly that direction, because she's on the right side of that'. 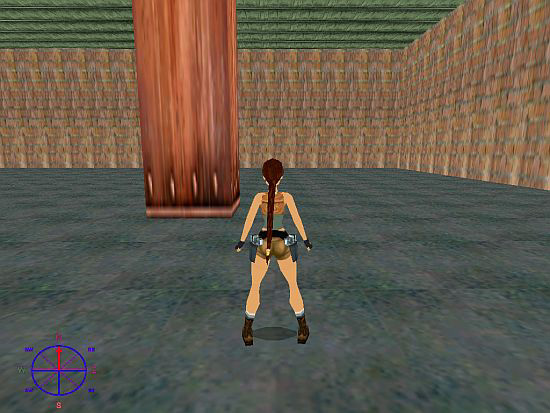 Lara faces exactly north (0) when the level starts. She turns leftwards a bit, getting into the left sector (from 337,5° to 360°) of the north main direction. The 'left' arrow appears. She turns leftwards a bit more, getting into the right sector (from 315° to 337,5°) of the northwest main direction. The 'right' arrow appears. - If LBB1=0 then it means Lara faces exactly a main direction, the game won't place any arrows on the screen. - If LBB1=1 then it means Lara faces a right half-sector, the game will place the 'right' arrow on the screen - or else (if it is 0 or 2) it will remove that. - If LBB1=2 then it means Lara faces a left half-sector, the game will place the 'left' arrow on the screen - or else (if it is 0 or 1) it will remove that. - if LBB2=0 then it means Lara faces from 337,5° to 22,5°, the game will place the 'north' sprite on the screen - or else (if it is 1-7) it will remove that. - if LBB2=1 then it means Lara faces from 157,5° to 202,5°, the game will place the 'south' sprite on the screen - or else (if it is 0 or 2-7) it will remove that. - if LBB2=2 then it means Lara faces from 247,5° to 292,5°, the game will place the 'west' sprite on the screen - or else (if it is 0-1 or 3-7) it will remove that. - if LBB2=3 then it means Lara faces from 67,5° to 112,5°, the game will place the 'east' sprite on the screen - or else (if it is 0-2 or 4-7) it will remove that. - if LBB2=4 then it means Lara faces from 292,5° to 337,5°, the game will place the 'northwest' sprite on the screen - or else (if it is 0-3 or 5-7) it will remove that. - if LBB2=5 then it means Lara faces from 22,5° to 67,5°, the game will place the 'northeast' sprite on the screen - or else (if it is 0-4 or 6-7) it will remove that. - if LBB2=6 then it means Lara faces from 202,5° to 247,5°, the game will place the 'southwest' sprite on the screen - or else (if it is 0-5 or 7) it will remove that. - if LBB2=7 then it means Lara faces from 112,5° to 157,5°, the game will place the 'southeast' sprite on the screen - or else (if it is 0-6) it will remove that. Unfortunately, sometimes we can't use a full circle with 65535, because the game will divide that 65535 into two halves, when using some given properties: into a first half from 0 to 32767 and into a second half from 0 to -32768. (32767+32768=65535). As you see in the illustration above, this time we will also use that two half circles, because that's how 'Facing Horizontal (Short)' field will work now. We'll define Lara as the subject of the Item Memory Zone. Then we'll put the actual value of the 'Facing Horizontal (Short)' field into Local Long Alfa (LLA) variable. Lara is the actual subject of the Item Memory Zone now, so the 'Facing Horizontal (Short)' value is the actual horizontal facing of Lara. It means we have from 0 to 32767 or from 0 to -32768 values in LLA now, as the horizontal facing values of her. 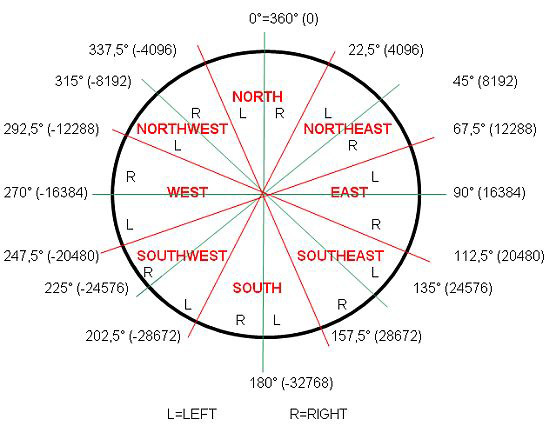 So, for example: if LLA value is between somewhere 20480 (112,5degrees) and 24576 (135degrees) now, then we'll know that Lara is just facing southeast, a bit leftwards from that, so the game will set LBB1 as 2 and set LBB2 as 7, putting the 'southeast' and 'left arrow' sprites on the screen, removing any other sprites off that. 1. 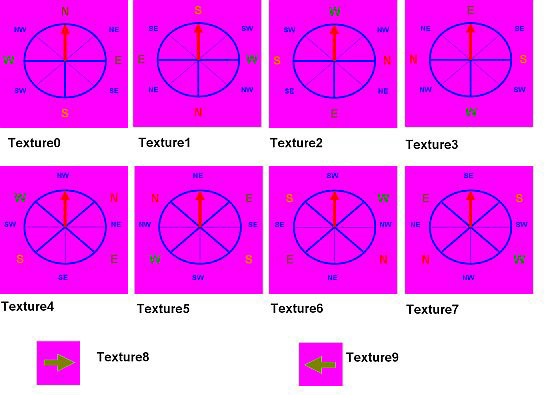 As you'll see below, in our setup we'll use condition triggers to study the facing values in LLA. They have five digits sometimes so they are huge numbers sometimes. It means we need the PARAM_BIG_NUMBERS method to define those values for the condition triggers. But, unfortunately, PARAM_BIG_NUMBERS values sometimes can't be negative numbers. And this is an unfortunate case like that now. So, if we have values from -1 to -32768 in LLA, then we'll use a trigger that will invert the sign of that LLA value. So now the condition is able to study that positive value in LLA, because that positive value can be defined in PARAM_BIG_NUMBERS now, as a value from 1 to 32768. 2. Yes, we used a 'long' variable for the 'Facing Horizontal (Short)' field, and not a 'short' variable. It's because 'short' variables are useable only from Value -32768 to Value 32767. And if I invert the sign of -32768 then 'short' variables can't take Value 32768. 3. I decided that the 'border values' always belong to the left half-sectors in this setup. So, for example -4096 belongs to the north/left half-sector (and not to northwest/right half-sector), but 4096 belongs to the northeast/left half sector (and not to north/right half-sector) etc. 4. Flyby sequences and other cameras will always show this compass. If you don't want that then disable the GlobalTriggers of the compass, temporarily, while the camera is working. - You can't use LBB1, LBB2 and LLA variables for other purposes in your level. - You need to use the 'north' sprite in CUSTOM_SPRITES Texture 0 slot, use the 'south' sprite in CUSTOM_SPRITES Texture 1 slot etc., as I wrote above. - GlobalTrigger#1 defines the LBB1 and LBB2 values, using the positive (or 0) LLA values. - GlobalTrigger#2 defines the LBB1 and LBB2 values, using the negative LLA values. - GlobalTrigger#3, 4, 5, 6, 7, 8, 9 and 10 place/remove the proper main direction sprite on/off the screen. - GlobalTrigger#11 and 12 place/remove the proper arrow sprite on/off the screen. It says if the condition in TriggerGroup#1 is true then TriggerGroup#2 will be executed. So, the game sets Lara as the actual subject of the Item Memory Zone, then copies 'Facing Horizontal (Short)' Item Memory Zone field actual value into LLA. Then it studies if LLA is bigger than PARAM_BIG_NUMBERS Position#0 value (i.e. 0) or is equal with that. X is a PARAM_BIG_NUMBERS position whose value the trigger will use. The value in PARAM_BIG_NUMBERS Position#0 is 0 now, the value in PARAM_BIG_NUMBERS Position#1 is 4096 now etc. If X is A then that is Position#10. B is Position#11, C is Position#12. Y is 0, 1 or 2. Z is 0, 1, 2, 3, 4, 5, 6 or 7. So, if LLA is PARAM_BIG_NUMBERS Position#0 value (i.e.0) ($8000, 112, $28) then Lara faces exactly the north direction, so the game will set LBB1 as 0 ($2000, 232, $44) and set LBB2 as 0 ($2000, 232, $45). If that is not right, then see the next condition (TGROUP_ELSE). So, if LLA is smaller than PARAM_BIG_NUMBERS Position#1 value (i.e.4096) ($8000, 112, $127) then Lara faces the right half-sector of the north direction, so the game will set LBB1 as 1 ($2000, 232, $144) and set LBB2 as 0 ($2000, 232, $45). So, if LLA is smaller than PARAM_BIG_NUMBERS Position#3 value (i.e.8192) ($8000, 112, $327) then Lara faces the left half-sector of the northeast direction, so the game will set LBB1 as 2 ($2000, 232, $244) and set LBB2 as 5 ($2000, 232, $545). GlobalTrigger#2 says if the condition in TriggerGroup#3 is true then TriggerGroup#4 will be executed. 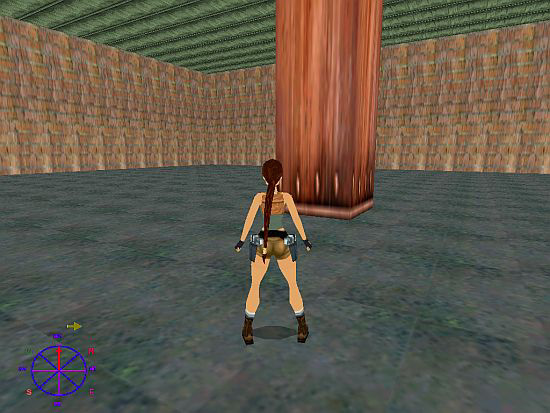 The condition in TriggerGroup#3 is: the game sets Lara as the actual subject of the Item Memory Zone ($5000, 46, $36), then copies 'Facing Horizontal (Short)' Item Memory Zone field actual value into LLA ($2000, 256, $1D70). Then it studies if LLA is smaller than PARAM_BIG_NUMBERS Position#0 value (i.e. 0) ($8000, 112, $27). So, first of all, the game will invert the sign in LLA. Then (see the similar triggers from TriggerGroup#2) the game will study LLA. If that is smaller than PARAM_BIG_NUMBERS Position#2 value (i.e.4097) ($8000, 112, $227) then Lara faces the left half-sector of the north direction, so the game will set LBB1 as 2 ($2000, 232, $244) and set LBB2 as 0 ($2000, 232, $45). So, if LLA is smaller than PARAM_BIG_NUMBERS Position#3 value (i.e.8192) ($8000, 112, $327) then Lara faces the right half-sector of the northwest direction, so the game will set LBB1 as 1 ($2000, 232, $144) and set LBB2 as 4 ($2000, 232, $445). So, if LLA is PARAM_BIG_NUMBERS Position#3 value (i.e.8192) ($8000, 112, $328) then Lara faces exactly the northwest direction, so the game will set LBB1 as 0 ($2000, 232, $44) and set LBB2 as 4 ($2000, 232, $445). X is 0, 1, 2, 3, 4, 5, 6 or 7. Y is 1, 2, 3, 4, 5, 6, 7 or 8. The GlobalTrigger says if the condition in TriggerGroup#14 is true then TriggerGroup#15 will be executed. But if that is not true then TriggerGroup#16 will be executed. If LBB2 is 3 then a sprite - that is defined in 'Parameters= PARAM_SHOW_SPRITE, 4' Script command - will be put on the screen. If LBB2 is not 3 then a sprite - that is defined in 'Parameters= PARAM_SHOW_SPRITE, 4' Script command - will be taken off the screen. 'Parameters= PARAM_SHOW_SPRITE, 4' Script command defines the Texture 3 of CUSTOM_SPRITES (i.e. the 'east' main direction sprite) and its screen coordinates. X is 1 or 2. The GlobalTrigger says if the condition in TriggerGroup#32 is true then TriggerGroup#33 will be executed. But if that is not true then TriggerGroup#34 will be executed. If LBB1 is 2 then a sprite - that is defined in 'Parameters= PARAM_SHOW_SPRITE, 10' Script command - will be put on the screen. If LBB1 is not 2 then a sprite - that is defined in 'Parameters= PARAM_SHOW_SPRITE, 10' Script command - will be taken off the screen. 'Parameters= PARAM_SHOW_SPRITE, 10' Script command defines the Texture 9 of CUSTOM_SPRITES (i.e. the 'left' arrow sprite) and its screen coordinates.